Hey, all you cool cats and bearcats! The Exit Zero Jazz Festival kicks into high gear next weekend, so it’s time to get down with some crazy changes, swingin’ combos, and some Cape May rotgut. This year’s festival runs April 22-24, with 20-time Grammy winner and barn burning axe legend Pat Metheny headlining. As part of their commitment to community involvement, back for a return engagement is CMBC’s official brew of Jazz Fest, Sophisticated Lady. This “down by law” beer cut its chops at the 2014 festival, and the mad props it got pretty much guaranteed that it’d be back for a second encore. Funky Belgian yeast is the frontman here, with lemon peel providing a walking bass — both combining in the pocket to lay down a number that’s citrusy, snappy, and bright. You’ll flip your lid over this brew — it’s out-of-this-world. Named after an instrumental piece composed by Duke Ellington in 1932, Sophisticated Lady comes from three of the legend’s grade school teachers, all of whom the thought “got their glasses on” because they spent summers in Europe. No jive! You’ll find that 18-karat doll on tap at multiple venues throughout the weekend, including at a six-tap Tap Takeover at The Ugly Mug on Thursday night. Be sure to check out Cabanas Beach Bar and Grill — everyone’s favorite barrelhouse — where we’ll be taking over six taps all weekend and multiple acts will play on the official Cape May Brewing Company stage. On Friday (9:30pm, 11:15pm) and Saturday (9:45pm, 11:30pm), Brother Joscephus and the Love Revolution will play old school funk and soul, classic rock and feel-good gospel. On Saturday (2pm) and Sunday (1pm), award-winning vocalist Sofia Rei will show you why the Village Voice dubs her a “leading light of Latin Jazz.” Then, on Sunday (3pm, 5pm), Son Little, Philadelphia-based rhythm and blues musician who has opened for the likes of Leon Bridges, will close out the weekend here. CMBC fans get special discounts on this year’s Pops Pass — a $45 ticket for only $38, getting you first-come, first-served entry to all Festival venues and entry to non-sold out Convention Hall performances. 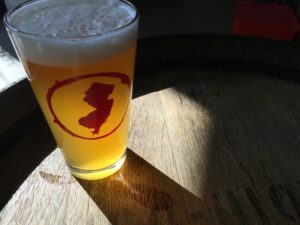 Check out Ticketfly for event tickets, and use the code BESTNJBEER at checkout. Don’t miss this groovy scene, Jack. We gotta split! Ask Lead Brewer Brian Hink why this brew is called Sophisticated Lady as opposed to, you know, Trampy Lady, and he’ll tell you: “There aren’t any trampy women here… this isn’t Atlantic City!” (No offense to our northern neighbor.) But there’s more to it than that. Sophisticated Lady is an instrumental piece that was composed by jazz legend Duke Ellington in 1932. The song was inspired by three of Duke’s grade school teachers, all of whom he considered classy because they spent their summers traveling Europe. Okay, but what if I want a Miller Lite instead? What? A Miller Lite fan at jazz fest? It’s not called the Exit Zero International Top Forty Festival. Go find a moshpit, you heathen.